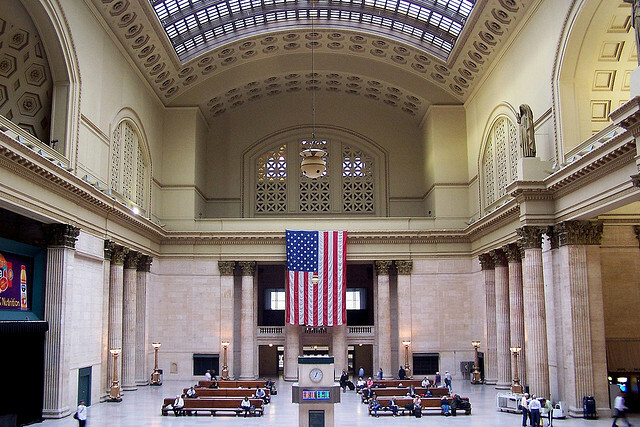 The Great Hall at Chicago’s Union Station. Can art raise the profile of this underused space? I’m constantly flummoxed by my trips through Chicago’s Union Station, the gorgeous Beaux Arts gem designed by Daniel Burnham. Instead of being able to glory in (or even easily find) the Great Hall, like most travelers I more often spend most of my time navigating the cramped and low-ceilinged labyrinth below. To be relegated to the dismal basement of one of Chicago’s soaringly beautiful spaces seems like a punishment for a crime I cannot fathom, much less have possibly committed. What have any of us done to deserve this? There is something of an effort to re-envision things, in the form of a master plan for the station undertaken by the Chicago Department of Transportation, Amtrak, Metra and others. Since the goal of the plan is to increase the station’s capacity (according to CDOT, Union Station sees as much traffic as some of the busiest airports in America), it won’t necessarily help travelers get more quality time or things to do in the Great Hall. But as part of the process, there has been an interesting, summer-long experiment to make Union Station more of a place to hang out. Initiated by the Metropolitan Planning Council (MPC), the Activate Union Station placemaking contest resulted in two installations - a nylon sculpture called “Blah Blah Blob!” on the Plaza and “trainYARD” an interactive park-like space in the midst of the Great Hall. Both were an attempt to enliven generally glum places through a mix of lectures, fitness classes and other activities. Mandy Burrell Booth of the MPC says the project drew lots of attention to the station. And though it wrapped up over the Labor Day weekend, she hopes its long-term impact will be in getting planners to think of Union Station as an important destination and economic catalyst for surrounding neighborhoods, and not just a space to pass through. Though the project is a great effort to bring creative ideas to the space, I’d honestly prefer art or music over a corn-hole toss in the Great Hall. And Friday I’ll get my wish, when an art event organizers have dubbed a “nomadic happening” pulls into Union Station. Station to Station is a train based, traveling art, music, food and film event that kicks off Friday in New York. Over the course of three weeks, it will pass through nine other train stations scattered across the country. The actual art program also reflects the transient feel of train travel. Some artists will hop on for one or a couple of stops while others will stay on board the entire journey. There’ll be stops in Pittsburgh, Sante Fe, Barstow and Los Angeles before the journey ends in Oakland, California. And on September 10, the train arrives in Chicago. It’s hard to know what all of this adds up to: An exciting evening of improvisation and cutting edge work by top shelf and emerging artists? Or just a hot art mess? One good sign: The concept is the work of Doug Aitken, who seems to have a gift for enlivening all sorts of public spaces with ambitious and often mesmerizing art projects. The event (which is underwritten by Levi’s) is also a fundraiser for nine “partner museums” including The Museum of Contemporary Art in Chicago. The goal is to “support non-traditional programming” in these places, but it might also nudge the MCA and others to bring their creative clout to bear on the station. If so, Station to Station won’t just be a more complicated take on the now annoyingly familiar (and often aesthetically underachieving) pop-up art show. It could provide another vehicle for lifting the public profile — and even public spirit — of Union Station. What do you think? Should we have more programming, art or otherwise, in the Great Hall? What would you like to see happening there?